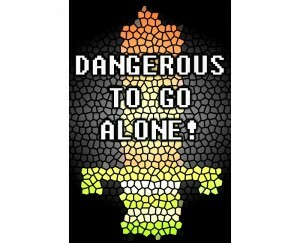 Submissions are now closed for “Dangerous to Go Alone!”, Manawaker Studio’s first poetry anthology, edited by CB Droege. These guidelines are now here only for reference purposes. We are looking for poems inspired by video games or video game culture. For legal reasons, poems should be somewhat abstract. Specific characters and situations can be mentioned, but it’s better if they are only alluded to. We feel that poetry is pretty well protected by fair use in this case, but keep in mind that the more specific IP is used in a poem, the more likely that it might get rejected simply for being risky. Poems (no more than five, please) should be included in the body of an e-mail (see below). If your poem requires special formatting not available in an e-mail, attach an RTF file. We are looking for artwork inspired by video games or video game culture in two categories. The interior of the book will contain some B&W illustrations to accompany the poetry. The cover of the book will feature a full color illustration. For legal reasons these illustrations should not feature any depictions of copyrighted characters, locations, or other IP. Visual art is not protected by fair use in this case, so if it looks risky at all, it will be rejected. All images should be attached to an e-mail (see below) as a lossless PNG or JPG. If sending multiple pieces (no more than five, please), ZIP them up first. Previously published work is okay, as long as A) it’s over a year past the original publication; B) you let us know where it was published previously, so we can credit them in the book; and C) it’s okay with the original publisher. It’s the submitter’s responsibility to ensure they have the rights to their work before submitting. If the work is self-published online (like in a personal blog, forum, facebook, deviant art, etc.) We’d like it taken down upon acceptance into the anthology, and remain down for one year past the anthology publication date. If your work is accepted, you will grant Manawaker Studio the right to publish the work exclusively for one year starting at the time of the publication of the anthology. The work or parts of it may also be used for promotional purposes in print or online. Compensation for inclusion in the anthology will be a token payment of $1 per accepted work and an electronic copy of the final book. Contributors may also order the physical book at a discounted price, so that they may resell it at signings, readings, and shows without having to bump the cost above the MSRP. All submissions should be sent to submissions@manawaker.com with ‘DtGA Submission’ and your last name in the subject line. Include a brief cover letter and a bio (65 words max) in the body of the e-mail. If you’d like a URL for an online portfolio or blog included with your bio, give that as well. Deadline for submissions is August 1, 2015. The publication date for the anthology is currently not set, but will likely be Fall 2015.